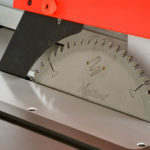 Sadly, table saws are a common source of injuries, but most of these injuries could be avoided by woodworkers who take the time to learn the proper ways to make different types of cuts. Consider these tips about the best way to make your cuts. You should make sure that the height of the blade so that the gullet is even with the height of the top of the wood that you intend to work with. Typically, the less blade that you can leave exposed, the safer you will be. If you are not sure how to adjust your saw correctly, you can find some videos and photos on the Internet to help you. Did you get a blade guard with your saw? 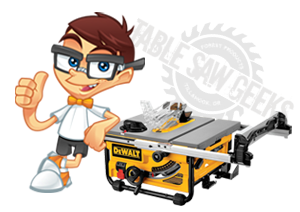 If you are like many woodworkers, you did because they come standard with table saws. However, you may have decided that it was a part that you did not need to bother with before you tossed it aside. The guard should come with an assembly that also has an anti-kickback unit and splitter. Absolutely, dust off this essential part of your safety equipment and put it back on. If you want to cut safely, and even more important, teach your kids to use saws safely, you should always work with the blade guard on. It is hard to say why many woodsman take this part off, but many accidents would not happen if it was left on. * Plastic finger guard: There will be a plastic guard that keeps your fingers out of harm’s way. Surely you find your fingers important and want to keep them. * Splitter: There is also something called a “splitter,” and this part keeps the board from pinching into the blade so it kicks back. This is particularly important with some kinds of wood and less powerful saws too. * Anti-kickback: A piece called a “pawl” helps keep the board from kicking back and either moving the table saw or hitting you. Tiny teeth on this part grip onto the board, so it won’t kick back and hurtle towards you while you are working. To cut safely, try to keep the board pressed firmly against the fence guard. Make sure that the table saw and board have your full attention, and that you are not distracted by things going on around you. Just keep pushing the board through the blade at a consistent and steady rate of speed. Most people who have been injured say they got distracted when they had an accident, and this sounds plausible. Finally, you can purchase something called a push stick that you use to keep pushing your wood through the blade. This allows you to keep your own hands much further back, so it reduces the chance that you will get your fingers cut if you do make a mistake. This is particularly useful if you need to cut very narrow wood that won’t give you a lot of room to move your hands. It’s great that you want to share your woodworking hobby with kids, but you really need to take the time to judge if they are ready or not. Also, make sure they stand well back while you are sawing, so they don’t get hit by any of the kickback or debris. In any case, you need to demonstrate proper safety techniques at all time if you expect your kids to follow them.